Are you missing teeth and disappointed with the appearance of your smile? Instead of hiding your smile and living with your disappointment and embarrassment, give your dentist a call. They can help replace your missing teeth with dental implants. Dental implants are one of the most recommended methods for replacing missing teeth. This is because it provides the sturdiest and longest-lasting results. The method is the closest to mimicking the structure of a natural tooth, creating a firm base and a life-like restoration. Your dental implant will be securely attached to your jawbone, so no one will be able to tell you were ever missing a tooth. You’ll start by having a titanium post implanted into your jawbone. Overtime, the titanium will bond with your jawbone, mimicking the root of a healthy tooth. Your dentist will carefully craft a custom crown to complete the restoration, making sure to match the shape and color of your other existing teeth. 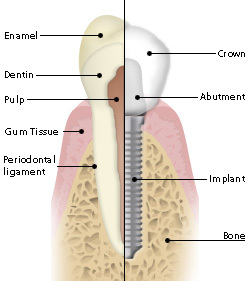 Once bonding has occurred, the crown will be attached to the post, completing your dental implant procedure. This isn’t the right solution for everyone because you need to have sufficient bone mass to support the implant. Your dentist will come up with the right solution for your smile. Dental implants can also be used to support dentures, giving them a more secure fit than ever before. If you’re missing teeth and aren’t satisfied with your smile, give your dentist a call today. Dental implants may be just what your smile needs. Your dentist would love to help you restore your smile and improve your self confidence with missing teeth solutions.